In our fast-paced world, it’s hard to focus on our deep inner purpose and values, and even harder to act consistently on them. It’s so easy to act (or better said, react) in the moment. Yet gauging whether a person’s actions align with intentions is a key factor in deciding whether to trust them. Set all that in motion. Watch the world rushing past on an average day. The ability to trust in the 21st-Century is constrained. There just isn’t enough time or information to make good trust decisions. So we learn to trust less, we grow more insular, sometimes cynical. But it gets worse. In the organizational context, the situation compounds. Take the basic trust problem that exists among individuals, and do the math. Is it possible to build a trusting organization? This is an area that is chock full of lip service and aphorisms. We seek to belong. We desire connection. So who doesn’t seek a place where they can trust and be trusted? We’re quick to say we want it. Yet the contributing factors are lost on so many of us, especially in the day to day. Stephen M.R. Covey’s Speed of Trust offers an excellent frame, but how much of that thinking do we actually bring to our relationships? How can these principles be applied in the workplace? Q1. In the fast paced 21st-C organization, how do you decide who to trust? Q2. Are “cultures of trust” real or imagined? Q3. Respect is key in the trust equation, but why? How do healthy boundaries factor in? Q4. Communicating intent implies knowing intent. How do we build/retain clear intention amid complexities of organizational life? Clearly, this discussion builds on all aspects of Intention (Ch.4) which we discussed here several weeks back. It also relates to a great #bealeader [transcript] conversation this week, where the focus was on integrity. 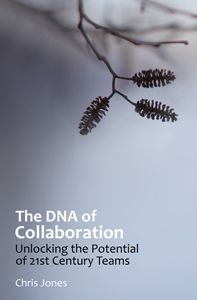 If we seek to be more effective collaborators … or leaders … this topic needs more focus than it gets. Trust me. Or, better still, challenge me: am I acting on my intent to see if trust is possible? Real change always starts with awareness. We need to see ourselves in the problem … then reflect on it, discuss it among our trusted colleagues … then the true learning begins, as we let the insights flow. This entry was posted on Saturday, October 6th, 2012 at 1:35 pm	and tagged with #cdna, collaboration, intention, respect, trust and posted in culture, intention, trust. You can follow any responses to this entry through the RSS 2.0 feed.